I was thinking the other day about drinking enough water and my mind wandered to the question: If I eat more cucumbers and watermelon, will it help improve the moisture in my skin? I am hardly a scientist, however in my mind, it seemed logical that if I eat foods high in water content that it can only help improve the moisture retention in my skin and help my skin look fresh and radiant. Was my hypothesis correct? Will Certain Foods Improve Skin Moisture Levels? It turns out my logic was spot on…at least this time! It is believed that the water you consume from food releases more slowly into the body. As a result, your water intake from food stays in your body significantly longer than the water you drink and your skin will look better from enhanced hydration. 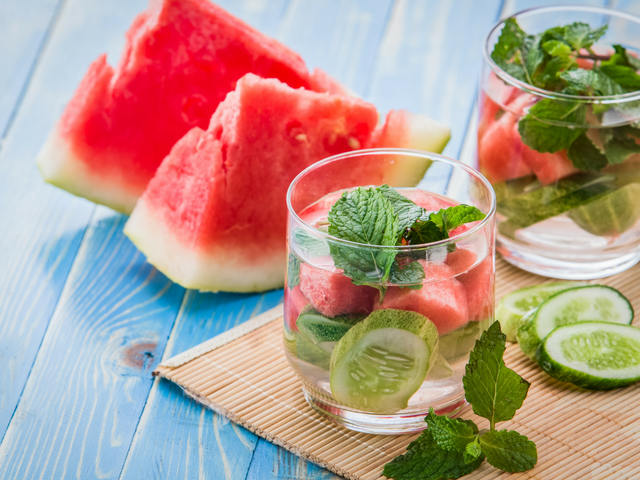 A 2009 study from the University of Aberdeen showed that foods such as watermelon and cucumber are twice as effective after working out over water. Foods with high concentrations of water also provide you with essential vitamins and nutrients that are lost in a workout. This is not to say you should replace drinking water with eating water entirely, however it is highly likely to be extremely advantageous to eat foods high in water content in addition to your daily water consumption for better-looking skin . Baby Carrots (90.4%) – Snacktacular! Bell Peppers (93.9%) – Crudite anyone? Broccoli (90.7%) – Soups, sides, veggie plate, and more. Cantaloupe (90.2%) – Breakfast and fruit salad are two options. Cauliflower (92.1%) – Have you tried cauliflower rice yet? Cherry and Grape Tomatoes (94.5%) – Salads and entrees. Celery (95.4%) – One for the mise en place and one for your mouth. Cucumbers (96.7%) – Highest water content of all! Grapefruit (90.5%) – Breakfast or juice. Iceberg Lettuce (95.6%) – It may not be flashy in nutrients, however it is not too shabby for hydration purposes. Radishes (95.3%) – Try it like the French, sliced on a piece of bread and salted butter. Or, toss them into salads. Spinach (91.4%) – Throw into nearly any entree or swap for any other greens. Strawberries (91%) – Add to your morning yogurt. Watermelon (91.5%) – Eat it all day long when it is in season. You will not need help shoveling it in. Zucchini (95%) – Raw or in entrees, both are delish. And, additional benefits to eating your water intake is that you reduce the number of plastic water bottles you purchase that are not good for the environment and the water inside food can often be less harmful than water from certain sources.